Reunion of the "Concerned Students Coalition"
Musical Interlude: Bach Prelude in G maj. If you are familiar with the NY Philharmonic, you know that Stanley Drucker is the Principal Clarinetist with the orchestra and has been playing with them for 60 years. Stanley is a young 80 years old, and maintains the active life of a busy symphony musician and soloist. He plays new music too, and last season gave a performance of Berio's Sequenza IX in NYC. He plans to retire from the Philharmonic at the end of the 2008-09 season, and is scheduled to perform the Copland Clarinet Concerto as soloist with them. After watching Drucker perform on national television at the historic concert in Pyongyang North Korea, I wrote him a letter and inquired about his recollection and memories about my famous musician cousin "Lui-jean" who played french horn in the orchestra from 1917 to 1962. Louis was very "quirky" and "superstitious" (as many orchestral musicians are). He would bless his horn case before opening it, bless it again when opened, and bless the mouthpiece before he took his first ritualistic blow. Being from southern Italy, he held many old world superstitions. On a tour, one of his roommates was astonished at how long Louis took to shave. It took "an eternity." He was a small and thin man, and extremely phobic about drafts and the cold. During plane trips Louis would stuff newspapers into his clothes to add extra protection form the cold air. His position in the orchestra was "Assistant First" which in those days meant supporting or alternating passages with the first horn player. James Chambers was in the chair position, but everyone in the horn section got along very well. When I mentioned that the NY Times retirement article about Louis indicated that he never missed a concert in his 45 years of playing, Drucker replied that "in those times musicians did not dare to miss a concert - not even for a funeral." Louis was very funny, and joked all the time. His favorite word was "mingya" - probably a dialect form of Italian meaning "oops." When I asked if Louis was close to Toscanini, Drucker explained that he probably was, but that he had no specific knowledge of it since he had not played under Toscanini himself. Finally Drucker said that during the NY Philharmonic's season of 1939-40, a book was published with attractive drawings of all the musicians accompanied by their bios. Louis of course was among them. Drucker may send me a photocopy of that page if he can locate it. According to a NY Times article dated 5/18/62, Louis' career with the NY Philharmonic was longer than that of any other member of the orchestra at that time. He said to the Times that he had participated in more that 5,000 concerts. For the first nine years of his career he was the youngest member of the orchestra. 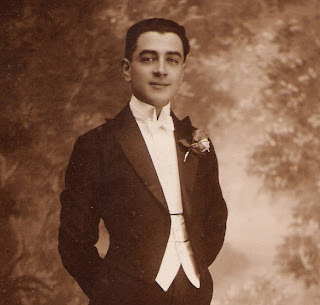 Louis was born in Cervinara Italy (near Naples), and came to the United States in 1913. On a visit to NY in May of 2009, I went to hear the NY Philharmonic. On display in Avery Fisher Hall were some interesting photos and posters dating from the period when Louis played with the orchestra. To the left is a poster for the summer of 1943 "Stadium Concerts." Louis performed in every single one of those over the years. I also found a very large panoramic photograph hanging on the wall which was taken in 1925 of the entire orchestra when they were on tour in Washington D.C. The US Capital building is in the back, and their music director at the time - Willem Mengelberg (1871-1951) - is standing with the orchestra. The Dutch conductor was friends with a former NY Philharmonic music director: Gustav Mahler. Mengelberg held lead position with the NY Philharmonic from 1922-1928, and shared the podium with Toscanni beginning in 1926. While individual members of the orchestra were not identified in the large photo, I was easily able to pick cousin Louis out of the crowd of 100-plus faces and snap a photo of him on my digital camera. He is pictured directly in the center of the photo shown below. Using the new database on the NY Philharmonic website, I was able to determine that the Washington DC concert took place on Tuesday March 10th, 1925 at 4:30 in the afternoon. It featured Italian violin soloist Scipione Guidi. The orchestra played Ein Heldenleben Op. 40 by Strauss on the first half of the program, and Beethoven's Third Symphony Op. 55 on the second half. Gazing into family history through a previously unknown but historically significant photograph such as this was a great discovery and a wonderful experience. Louis was at the height of his career at a time when classical music was at a cultural peak. Seeing this photo for the first time gave me a sense of connection with the past. The family resemblance is unmistakable.